City Perch and iPic – Roll the Credits! Located in the Pike & Rose shopping destination in North Bethesda (Make that Rockville if you want to find it on MapQuest) iPic the latest innovation for moviegoers. The cutting edge theater concept takes it to a whole new level with features like plush leather recliners operating with the touch of a button and personal pillows and blankets. This movie theater combines the coziness of a home theater with the luxury of upscale dining. No need to stand in line for food or drink. A seat-side button beckons a server to take your order. 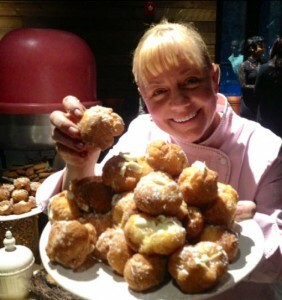 The theater is on the same level as City Perch restaurant and both the iPicExpress menu, called ‘dining in the dark” and the more gourmet City Perch restaurant menu, have been conceptualized by Sherry Yard, the James Beard Foundation recognized pastry chef, who has worked alongside Wolfgang Puck for many years. City Perch Executive Chef Matt Baker, formerly of The Occidental, helms the state-of-the-art kitchen while noted Mixologist and Master Sommelier, Adam Seger, formerly of Per Se, has designed the wine and cocktail program. Try his new “Roll in the Hay” seasonal cocktail made with Belle Isle Moonshine and Laird & Company Apple Brandy and roll the credits, please. Roberto Hernandez is the new Executive Chef at Mio, the place for Latin American cuisine that keeps its emphasis on the classic dishes of Puerto Rico. Hernandez likes to blend modern with rustic. 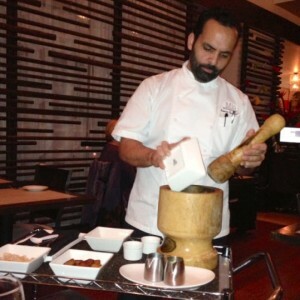 His mofongo, made tableside, is so authentic I thought I heard Jennifer Lopez singing “Plenarriquena”! Try the newly instituted Saturday brunch. 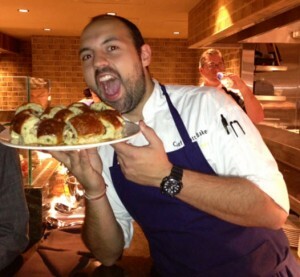 And in other switcheroos Nick Stephanelli leaves Bibiana Osteria-Enoteca to open his own spot. Expect Jake Addeo to bring his sophisticated Italian cuisine to the popular New York Avenue restaurant. 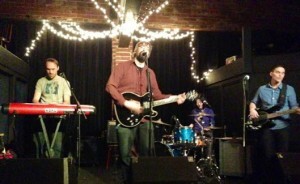 Last month I dropped into Iota in Clarendon to hear a band I’d been following for awhile. Grownup Noise is a quirky, smart, tuneful group out of Cambridge, MA who write their own exquisitely melodic songs. Boston Herald’s Music Critic Jeff Gottlieb calls their latest album, The Problem with Living in the Moment, “a suite” for its sweeping orchestration. In my playbook they stand out as accomplished musicians in their own right, but they’re also nice guys, articulate and kindhearted, and a beautiful Asian kickass female drummer. Though they had originally been billed as the “B” act the headliners showed up with only two musicians giving Grownup Noise the status they deserve. Manna to their fans. Here’s the video for their single “Astronomy as Therapy” which manages to blend banjo sound with gorgeous violin strains. It puts me in mind of the soundtrack from On Cold Mountain. In the cozy brick-walled club I began to read over the bar menu and noticed a few hard ciders. 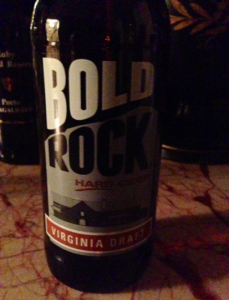 I went with Bold Rock Hard Cider’s “Virginia Draft”, a golden-hued cider on the sweeter side from a Virginia company who now claims seven varieties, from dry to sweet to full-bodied. Instantly the crisp, clean apple taste recollected my first bottle of hard cider at the now-shuttered Les Halles. A chain of French restaurants based in New York City, it’s where Anthony Bourdain once ruled the kitchen early in his career. On that sunny day we were there to watch the French waiter races, a tradition that had started at Dominique’s famously posh celebrity haunt in DC and now continues with Paul bakery further down Pennsylvania Avenue. In any case, I believe I was hooked on cider that day. It’s funny how a flavor memory can bring up the people, the place and the moment in time when you had a palate epiphany. Back then hard cider wasn’t a common beverage and this was a French cider. I didn’t see it on any bar lists, and soon forgot about it. Fast forward to a few years ago, a cosmic blip in the beverage industry, when hard cider burst upon the scene. Nowadays there are quite a few cideries, even breweries, dabbling in the production of these delicious, low-alcohol, apple-based fermented drinks and many of them are in Virginia where the apple is king. N. B. They are not “brewed” as beer is. They are “fermented”. I am not a physicist. At National Geographic’s farm-to-table dinner last week, Albemarle CiderWorks “Red Hill” cider was paired with scallop crudo on Executive Chef Matthew Crudder’s 5-course dinner. The delicately dry cider is made with Winesap and Pippin apples, the perfect match for the chilled raw mollusk. Think Chardonnay as a reference point. And where’s that Christmas ham? Michel Richard has done it again! The winter menu he has created for the Garden Café at the National Gallery of Art is absolutely divine! Let’s face it. 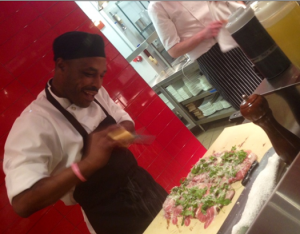 Most of us can’t afford to eat at Central Michel Richard, the chef’s pricey Pennsylvania Avenue outpost. 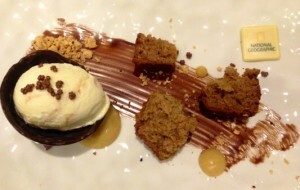 But in the beautiful fountain-graced café, a stone’s throw from the Degas exhibit, you’ll find his latest menu has echoes of the dishes he turns out in his American-with-a-French twist restaurant. Designed to dovetail with the Degas exhibit, this menu is all French and keeps winter away with crusty olive fougasse; pumpkin bisque with toasted pumpkin seeds; roasted fennel with pears and cranberries; arugula salad with roasted beets, apples, pecans and champagne vinaigrette; and roasted butternut squash with Brussels sprouts. And that’s just the beginning. An entrée of braised Cornish hen with roasted lemons beckons, and crème brulee with fresh berries finishes it off nicely. Find me another menu in town as fabulous as this at $20.75 for all you can eat. I dare you! Oh, and did I mention Richard was recently conferred with the insignia of Chevalier de la Legion d’honneur? That officially puts him in the pantheon of the Greatest French Chefs ever! Okay, Michel. You may now rest on your laurels. 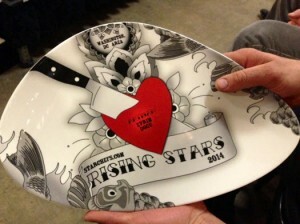 Last week I mentioned the upcoming StarChefs “Rising Stars” event was going to be stellar. And it was. Award winners were in great spirits, especially since they partied together the night before. Emceeing the fabulous event was Chef/Owner of Bayou Bakery and host of Travel Channel‘s “American Grilled”, David Guas, he of the Elvis sideburns. Here are a few photos from the gala taken at Union Market’s hip warehouse event space, Dock5. These days, watching your carb intake has become more than just a diet regime. Unless you’re a long distance runner or cross trainer you might be trying to keep those flour-filled ingredients in check. But take pizza out of the equation? That dog don’t hunt, as we say down South. This newest addition to the laidback Ballston scene, Pizza Vinoteca, has taken the guilt out of pizza by making all of their pies – not pies. That is to say they’re all made in flatbread style in a custom-designed Jade Range grill. The monster infrared grill features 16 burners that climb to a raging 900 degrees, cranking out pizzas in less than five minutes. Three woodchip smoke boxes conspire to lend a nice char and crave-able smoky flavor. 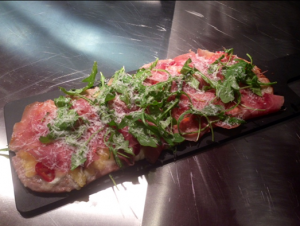 These super-thin pizzas come in a large variety of combinations. And even though the place boasts entrees, antipasti, salads, 38 world-sourced affordable wines by the glass, plenty of local craft beers and gelati, we are here for the P-I-Z-Z-A! Divided into two categories, “Classic” and “Crafted”, our tasters fell hard for the roasted wild mushroom with goat cheese and leeks, and another made with jowlciale (tender pork cheeks), chili pesto and toasted pistachios. 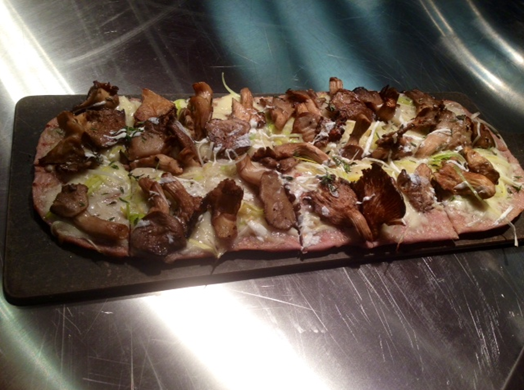 The tarte flambée (good, but oh so rich) was better left for athletes-in-training. With a communal table that seats 18, it’s a fun place for groups too.